Every once in a while, I stumble upon what seems to be an original yet timeless paradigm. It reminds me of Paul McCartney sharing his tune, “Let it Be” with others because he was sure he had stolen it inadvertently. Tonight, I wish to share a Venn diagram that explains a lot of who my patients have been for the last ten years. 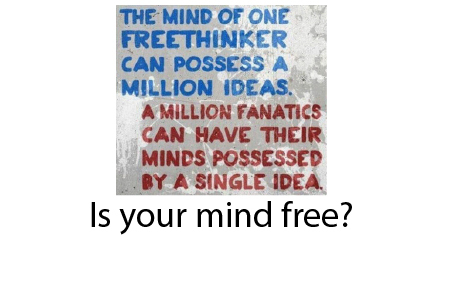 They are free thinkers. What does that entail? It means being open-minded, yet critical. That is why the first few dozen patients I had were all CEO/founder types with a science background. A CEO/founder knows that the path forward is not one that comes from being afraid and following the crowd. A person of science weighs the facts and doesn’t rely upon the source as much as the message and its intuitive resonance. When you look at the above diagram, some might think that critical and close-minded are synonymous. But actually, in this scheme, they are not. Being critical just means you demand evidence, logic, and plausibility. Being close-minded is the natural state of most people who rely upon others to provide expert opinions on things they feel are beyond their comprehension. I love the way Roland Orre, the creator of this diagram finds the people who are open-minded and uncritical to be insane. He also deems the close-minded and uncritical to be stupid. Finally, a person who is openminded and uncritical is a fool. I would say that only a single digit percentage of people are capable of free thinking because they are excessively close-minded and usually uncritical. They believe a famous person touting resveratrol but they don’t actually bother to look up and consider the evidence. Just this week, I had two very accomplished gentlemen call me and state that they had watched and read what I’ve been creating and were genuinely impressed. I immediately recognized they had taken many hours to deep dive into my work and found me to be a kindred free thinker. Compare this with the thousands who have been exposed, often by friends and family who have been asked what their “secret” of anti-aging was, who were wholly unimpressed with my ideas. Through the years, I confess my work has amounted to mostly case studies, conjecture, and mostly hand-waving theories based on a superficial knowledge of science. I am glad the free thinkers deemed my lack of sophistication to be humility and simplicity of thought to be elegant. In contrast, most people become judgmental and angry when I talk about anti-aging. They question my credentials, my motives, and my right to weigh in. These tactics of not actually evaluating the ideas but rather defending some inherited bias are the hallmark of some pretty smart yet stupid people. They would rather trust in people whom they know are likely biased with their inane orthodox dogmas of aging then actually consider new ideas. That is uncritical. And they are close-minded to the possibility that a better paradigm might come from someone without tenure or a Nobel Prize. My tendencies towards free thinking, with its attendant open-mindedness, can sometimes get me into trouble as I will actually spend hours listening to fringe thinkers on topics of a flat Earth, ancient aliens, and political intrigue. But my solid critical thinking skills always seem to protect me from falling prey to subscribing to theories that lack corroboration in real life and from multiple sources. Especially in these times, it can been very difficult to maintain free thinking with all the picking of sides, propaganda, and close-mindedness. Too often, the respectable scientists don’t see themselves as the Pharisees of the modern church of Scientism. A true scientist should always welcome better models (i.e. being proven wrong). Sadly, the majority of influencers act more like temple money-changers “handing tickets out for God” instead of actually getting us back to the Garden of Eden to eat from the second tree: the Tree of Eternal Life. So thank you to all those free thinkers out there that provide me the support to continue. I know that my ideas are incomplete, simplistic, and fall short…but they remain unapologetically the best thoughts that I can conjure so hopefully they can guide others to improve our paradigms and our lives. Excellent commentary Dr. Park. I was talking with an old friend yesterday who does not have a label other than gadfly. It was noted by us that few people actually think..
Government schools are about conformity. 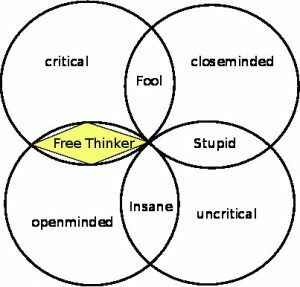 Free thinking is the antithesis of this. In thinking critically you tend to rely on Occam’s Razor (the best explanation for the observational data is the simplest explanation) in selecting from among alternate explanations. However, Occam’s Razor suffers from the lack of a universally accepted definition of “simplicity” and has additional deficiencies. A sometimes missed subtlety is that for the purpose of controlling a physical system (e.g. the system by which humans age) what is needed is not an explanation but rather is a conditional prediction aka “predictive inference.” Predictive inferences of infinite number are possibilities under incomplete information. In an attempt at controlling a system one must select from among these inferences but how? An inference has a unique measure that is called its “entropy.” The existence and uniqueness of this measure supports selection of the predictive inference that will be used in an attempt at controlling a system by optimization of the entropy. In research that began in 1963, the engineer and theoretical physicist Ronald E. Christensen developed methods for optimization of the entropy that he called “entropy minimax.” He and colleagues of his used these methods in the construction of many models, some of which were slated for use in the practice of medicine. One of Christensen’s findings from this work is that the optimal explainer of the past is not the optimal predictor of the future. The optimal predictor of the future regresses the numerical value of each conditional probability belonging to a model toward the unconditional value or “base rate.” Failure to regress the probability value estimate toward the base rate is associated with the fallacy that is called “base rate neglect” by modern cognitive psychologists. In an experiment that was conducted several decades ago among students and members of the faculty of Harvard’s medical school, base rate neglect led the majority of the participants to conclude that the value of the probability that a patient had the disease given that he was positive on a test for this disease was nearly 1 though the value that was computed through the use of Bayes’ Theorem was nearly 0! Before dying in the year 2016, Christensen documented his work voluminously. There is a bibliography at http://www.knowledgetothemax.com/Bibliography.htm . In the work entitled “Multivariate statistical modeling,” Christensen provides detailed instruction on how to select the optimal predictive inference from among the many possibilities. Perhaps you could adapt Christensen’s instructions to your needs in advising your patients. Should a free-thinker use Occam’s razor or another rule in deciding upon the inferences that will be made by a predictive model? The available evidence ( http://www.knowledgetothemax.com/Bibliography.htm ) suggests that entropy minimax pattern discovery works better. You have always been a hero of mine. I know I am one of the single digit folks, and I always enjoy your blogs. I am very grateful for the information that you write about.